Digital technology is simultaneously friend and foe, highly disruptive, yet it cannot be ignored. Companies that fail to make use of it put themselves in the line of fire for disintermediation or even eradication. But digital technology is also the biggest opportunity to reposition incumbent product-making businesses by thinking about how they conceive, make, distribute and support the next generation of goods in the marketplace. The Reinventing the Product book looks at the ways traditional products are transforming into smart connected products and ecosystem platforms at a rate much faster than most organizations think. "The nature of product innovation is fundamentally changing. Reinventing the Product shows how to combine hardware, software and business model innovation in an agile manner to meet the fast-changing needs of smart connected devices." Reinventing the Product makes a stringent case for companies to rethink their product strategy, their innovation and engineering processes, and the entire culture to build the future generations of successful "Living Products." Featuring case studies from global organizations such as Faurecia, Signify, Symmons and Haier—from interviews with thought leaders and business executives of top companies including Amazon, ABB, Tesla, Samsung and Google—it provides practical advice for product-making companies as they embark on, or accelerate, their digitization journey. "With grounded skill, Reinventing the Product makes a stringent case for companies to rethink their product strategy, their product road map and their digital capabilities." Eric Schaeffer and David Sovie show how this reinvention is made possible: by digital technologies such as AI, IoT sensors, blockchain, advanced analytics, cloud and edge computing, and by developing a radical new kind of product road map. They show how to deliver truly intelligent, and potentially even autonomous, products with the more personalized and compelling experiences that today’s users, consumers and enterprises expect. "Full of innovative insights about AI, platforms and smart products. 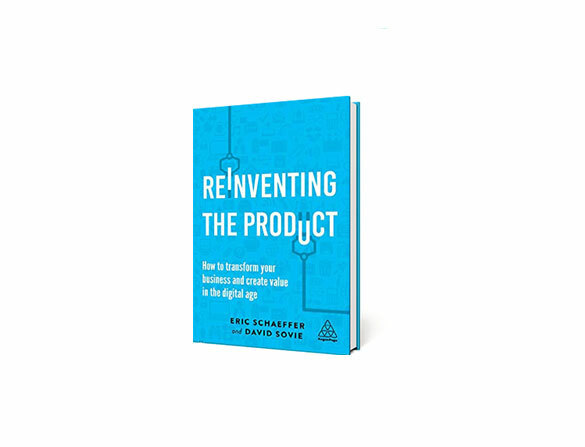 The ‘Product Reinvention Quotient’ provides great insights in how to think about 'Product X.0' and how to develop a set of capabilities that are necessary to succeed in the future." Eric Schaeffer is Senior Managing Director at Accenture and leads Accenture’s Products Industry X.0 practice. This brings together services across innovation, engineering and product development, manufacturing and digital operations, and product support services optimization. He is also the Global Lead for automotive, industrial equipment and infrastructure companies for digitally reinventing their businesses and creating new levels of innovation and efficiency across the extended connected value chain. David Sovie is Senior Managing Director at Accenture and the Global High Tech Industry Lead. He also leads the Industry X.0 practice for Accenture's Communications, Media and Technology group, which provides digital transformation services across the product innovation, engineering, manufacturing and product support business functions. His client work focuses on shaping and executing large scale transformation programs for leading technology companies globally. "Dave Sovie and Eric Schaeffer bring fresh thinking and inspiring practical advice for successfully managing digital transformation and creating value. "